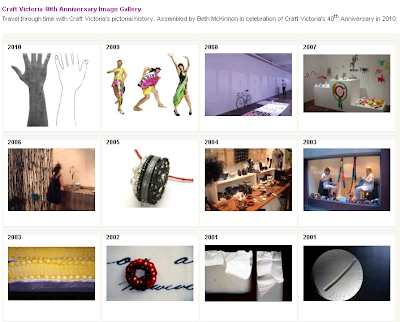 In celebration of Craft Victoria turning the big four-oh this year, our lovely volunteer Beth McKinnon has assembled a collection of images representing Craft Victoria's history from 1970 to 2010. Click the image below to visit the gallery and view images from that time we decided to knit in the enCOUNTER window, to the time of Black Christmas, and even to that one time we weaved and crocheted a giant scaffolding in Carlton. Great collection of images; it is amazing how things change over time, and change all the way back around again!